Proposition 64 Section 8. CRIMINAL OFFENSES, RECORDS, AND RESENTENCING. Chris Conrad celebrates the passage of Prop. 64 with Friends of Prop 64 on election night, 2016. The Adult Use of Marijuana Act 2016 did not repeal all the previous criminal penalties on marijuana but adjusted them downward and allows for more social justice. This section describes the remaining criminal penalties, downward resentencing for people with priors, destruction and expungement of records, early release from incarceration and juvenile justice. 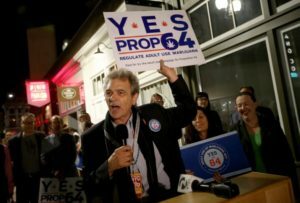 Hempresent Radio: Seattle Hempfest’s own Vivian McPeak interviews California activist Chris Conrad on why he is supporting Proposition 64, the Adult Use of Marijuan Act. Click here to listen in. 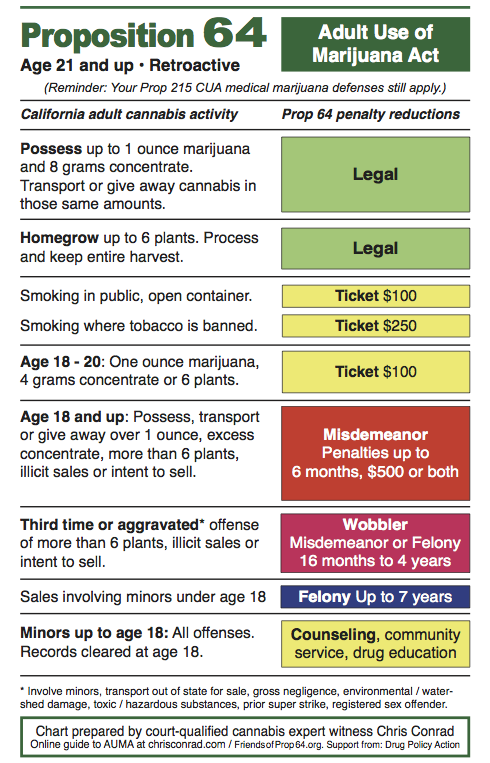 A compendium of California marijuana definitions and statutory laws related to cannabis hemp / marijuana as they were listed from 1976 to 2016, when the voters adopted Proposition 64. Do not rely on these for legal purposes, they are posted here merely as an historical archive of state laws.